Lord Edward FitzGerald (15 October 1763 – 4 June 1798) was an Irish aristocrat and revolutionary who died of wounds received while resisting arrest on a charge of treason. FitzGerald, the fifth son of the 1st Duke of Leinster and the Lady Emily Lennox the daughter of Charles Lennox, 2nd Duke of Richmond, was born at Carton House, near Dublin. In 1773 his father died and his mother soon afterwards married William Ogilvie, who superintended FitzGerald's education. He spent most of his childhood in Frescati House at Blackrock in Dublin where he was tutored by Ogilvie in a manner chiefly directed to the acquisition of knowledge that would fit him for a military career. FitzGerald joined the British Army in 1779 and he was Aide-de-camp on the staff of Lord Rawdon in the southern theatre of the American Revolutionary War. He was seriously wounded at the Battle of Eutaw Springs on 8 September 1781, his life being saved by an escaped slave named Tony Small (nicknamed "Faithful Tony", see Black Loyalist). FitzGerald commissioned a portrait of Tony Small by John Roberts in 1786. Lord Edward freed Small and employed him to the end of his life. FitzGerald was evacuated from Charleston, South Carolina in 1782 when the British forces abandoned the city. Webb surmises that the success of the American colonists in fighting against regular troops, led him in later years to the conviction that his countrymen in Ireland could cope with them with a similar result. 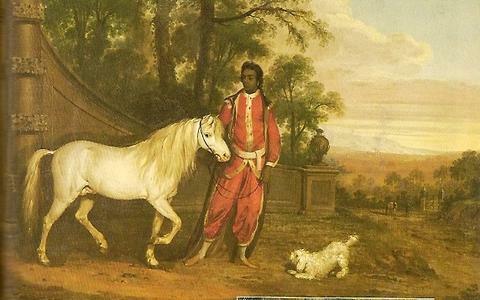 In 1783 FitzGerald visited the West Indies before returning to Ireland, where his brother, the 2nd Duke of Leinster, had procured Edward's election to the Irish Parliament as a Member for Athy, a seat he held until 1790. In Parliament he acted with the small Opposition Irish Patriot Party group led by Henry Grattan, but took no prominent part in debate. In the spring of 1786 he took the then unusual step for a young nobleman of entering the Military College, Woolwich, after which he made a tour through Spain in 1787. Dejected by unrequited love for his cousin Georgina Lennox (who later married the 3rd Earl Bathurst), he sailed for New Brunswick to join the 54th Regiment with the rank of Major. In April 1789, guided by compass, he traversed the country with a brother officer, from Fredericton, New Brunswick to Quebec, falling in with Indians by the way, with whom he fraternized. He accomplished the journey of 175 miles in twenty-six days, and established a shorter practicable route than that hitherto followed. In a subsequent expedition he was formally adopted at Detroit by the Bear clan of the Kanien'kehá:ka (Mohawk) with the name "Eghnidal" by Karonghyontye (Captain David Hill), and made his way down the Mississippi to New Orleans, whence he returned to England. His Whig connections, together with his transatlantic experiences, predisposed Fitzgerald to sympathize with the doctrines of the French Revolution, which he embraced enthusiastically when he visited Paris in October 1792. He lodged with Thomas Paine and listened to the debates in the Convention. At a convivial gathering on the 18 November, he supported a toast to "the speedy abolition of all hereditary titles and feudal distinctions", and gave proof of his zeal by expressly repudiating his own title, a performance for which he was dismissed from the army. While in Paris, FitzGerald became enamoured of a young girl whom he chanced to see at the theatre, and who is said to have had a striking likeness to Elizabeth Sheridan. Procuring an introduction he discovered her to be a protégée of Stéphanie Félicité, comtesse de Genlis (Madame de Sillery), Governess to the Children of France. The parentage of the girl, whose name was Pamela (1773–1831), is uncertain; but although there is some evidence to support the story of Madame de Genlis that Pamela was born in Newfoundland of parents called Sims, the common belief that she was the daughter of Madame de Genlis herself by Louis Philippe II, Duke of Orléans (to whose children she was then acting as governess), was probably well founded. On 27 December 1792, FitzGerald and Pamela were married at Tournai, one of the witnesses being Louis Philippe, afterwards King of the French; and in January 1793 the couple reached Dublin. Portrait of Edward FitzGerald by Hugh Douglas Hamilton, 1796. National Portrait Gallery, London. Ireland was by then seething with dissent which was finding a focus in the increasingly popular and revolutionary Society of the United Irishmen, which had been forced underground by the outbreak of war between France and Britain in 1793. Lord Edward FitzGerald, fresh from the gallery of the Convention in Paris, returned to his seat in the Irish Parliament and immediately sprang to their defence. Within a week of his return he was ordered into custody and required to apologise at the bar of the House of Commons for violently denouncing in the House a Government proclamation which Grattan had approved. However, it was not until 1796 that he joined the United Irishmen, who by now had given up as hopeless the path of constitutional reform and whose aim, after the recall of Lord FitzWilliam in 1795, was nothing less than the establishment of an independent Irish republic. In May 1796 Theobald Wolfe Tone was in Paris endeavouring to obtain French assistance for an insurrection in Ireland. In the same month, FitzGerald and his friend Arthur O'Connor proceeded to Hamburg, where they opened negotiations with the Directory through Reinhard, French minister to the Hanseatic towns. The Duke of York, meeting Pamela at Devonshire House on her way through London with her husband, had told her that "all was known" about his plans, and advised her to persuade him not to go abroad. Also, in Hamburg Lord Edward met with Johan Anders Jägerhorn (or baron de Spurila, as he called himself), a Finnish Swede who had advocated Finnish autonomy and now acted as an intermediary between Lord Edward and the French. The proceedings of the conspirators at Hamburg were made known to the government in London by an informer, Samuel Turner. Pamela was entrusted with all her husband's secrets and took an active part in furthering his designs. She appears to have fully deserved the confidence placed in her, though there is reason to suppose that at times she counselled prudence. The result of the Hamburg negotiations was Hoche's abortive expedition to Bantry Bay in December 1796. In September 1797 the Government learnt from the informer Leonard McNally that Lord Edward was among those directing the conspiracy of the United Irishmen, which was now quickly maturing. He was specially concerned with the military organisation, in which he held the post of colonel of the Kildare regiment and head of the military committee. He had papers showing that men were ready to rise. They possessed some arms, but the supply was insufficient, and the leaders were hoping for a French invasion to make good the deficiency and to give support to a popular uprising. But French help proving dilatory and uncertain, the rebel leaders in Ireland were divided in opinion as to the expediency of taking the field without waiting for foreign aid. Lord Edward was among the advocates of the bolder course and there is some evidence that he favoured a project for the massacre of the Irish peers while in procession to the House of Lords for the trial of Lord Kingston in May 1798. It was probably abhorrence of such measures that converted Thomas Reynolds from a conspirator to an informer; at all events, by him and several others the authorities were kept posted in what was going on, though lack of evidence produced in court delayed the arrest of the ringleaders. But on the 12 March 1798 Reynolds' information led to the seizure of a number of conspirators at the house of Oliver Bond. Lord Edward FitzGerald, warned by Reynolds, was not among them. As a fellow member of the Ascendancy class, the Government were anxious to make an exception for FitzGerald, avoiding the embarrassing and dangerous consequences of his subversive activities. They communicated their willingness to spare him from the normal fate meted out to traitors. The Lord Chancellor, Lord Clare, said to a member of his family, "For God's sake get this young man out of the country; the ports shall be thrown open, and no hindrance whatever offered". FitzGerald however refused to desert others who could not escape, and whom he had himself led into danger. On 30 March the government proclamation of martial law authorising the military to act as they saw fit to crush the United Irishmen led to a campaign of vicious brutality in several parts of the country. This forced the United Irish executive to bring forward plans for the rising, with or without French aid. Lord Edward FitzGerald's social position made him the most important United Irish leader still at liberty. On 9 May a reward of £1,000 was offered by Dublin Castle for his apprehension. Since the arrests at Bond's, FitzGerald had been in hiding, but had twice visited his wife in disguise and was himself visited by his stepfather Ogilvie and his friend William Lawless; he generally observed less caution than his situation required. Meanwhile, the date for the rising was finally fixed for 23 May and FitzGerald awaited the day hiding in a house in Thomas Street, Dublin. FitzGerald's hiding place was disclosed by a Catholic barrister and informer named Francis Magan and on 18 May Major Henry Sirr led a military party to the house where Lord Edward was in bed suffering from a fever. Alerted by the commotion, he jumped out of bed and, ignoring the pleas of the arresting officers Captain William Bellingham Swan (later assistant town Major of Dublin) and Captain Daniel Frederick Ryan to surrender peacefully, FitzGerald stabbed Swan and mortally wounded Ryan with a dagger in a desperate attempt to escape. The weapon used by Lord Edward to defend himself was later stolen from Major Swan's house by Emma Lucretia Dobbin the daughter of Rev. William Dobbin and Catherine Coote. He was only secured after Major Sirr shot him in the shoulder. The scabbard reputedly used by Lord Edward Fitzgerald at his arrest in 1798 is held at Limerick Museum. He was conveyed to New Prison, Dublin where he was denied proper medical treatment. After a brief detention in Dublin Castle, he was taken to Newgate. Inflammation set into his wound. His wife, whom the government probably had enough evidence to convict of treason, fled the country before he died without seeing him again, but his brother Henry and his aunt Lady Louisa Conolly were allowed to see him in his last moments. At the age of 34 he died as the rebellion raged outside on 4 June 1798. He was buried the next day in the cemetery of St Werburgh's Church, Dublin. An Act of Attainder confiscating his property was passed as 38 Geo. 3 c. 77, but was eventually repealed in 1819. Irishmen, Countrymen, it is Edward FitzGerald's sister who addresses you: it is a woman but that woman is his sister: she would therefore die for you as he did. I don't mean to remind you of what he did for you. 'Twas no more than his duty. Without ambition he resigned every blessing this world could afford to be of use to you, to his Countrymen whom he loved better than himself, but in this he did no more than his duty; he was a Paddy and no more; he desired no other title than this. Fitzgerald was of small stature and handsome features. In the opinion of the anonymous writer of his biography in the Encyclopædia Britannica eleventh edition (1911) Fitzgerald's character and career have been made the subject of eulogies much beyond their merits. He had, indeed, a winning personality, and a warm, affectionate and generous nature, which made him greatly beloved by his family and friends; he was humorous, light-hearted, sympathetic, adventurous. But he was entirely without the weightier qualities requisite for such a part as he undertook to play in public affairs. Hotheaded and impulsive, he lacked judgement. He was as conspicuously deficient in the statesmanship as he was in the oratorical genius of such men as Flood, Plunket or Grattan. One of his associates in conspiracy described him as 'weak and not fit to command a sergeant's guard, but very zealous'. Reinhard, who considered Arthur O'Connor 'a far abler man', accurately read the character of Fitzgerald as that of a young man "incapable of falsehood or perfidy, frank, energetic, and likely to be a useful and devoted instrument; but with no experience or extraordinary talent, and entirely unfit to be chief of a great party or leader in a difficult enterprise. Lucy Louisa FitzGerald (1798 - September 1826), married on 5 September 1825 Capt. George Francis Lyon (died 8 October 1832). The County Roscommon GAA club Tulsk Lord Edward's is named after Fitzgerald. The Geraldines P. Moran GAA club in Cabinteely in Dublin is also named after him. ^ a b c d Chisholm 1911, p. 443. ^ Tillyard 1998, p. [page needed]. ^ portrait "Tony Small" (1786) by John Roberts. ^ Chisholm 1911, pp. 443–444. ^ a b c d e f g h i j k l m n o Chisholm 1911, p. 444. ^ Price, Munro (2008). The Perilous Crown: France Between Revolutions, 1814-1848. pp. 33–34. ISBN 978-0330426381. ^ McNeill, Ronald John (1911). "Fitzgerald, Lord Edward". Encyclopædia Britannica (1911 ed.). p. 445. Retrieved 3 March 2018. ^ Chisholm 1911, pp. 444–445. ^ Alger 1889, p. 111. ^ Bourke 2002, p. 59. ^ a b c Chisholm 1911, p. 445. ^ Copland-Griffiths 1908, p. 264. Alger, John Goldworth (1889). "Fitzgerald, Edward (1763-1798)" . In Stephen, Leslie. Dictionary of National Biography. 19. London: Smith, Elder & Co. pp. 110–111. This article incorporates text from a publication now in the public domain: Chisholm, Hugh, ed. (1911). "Fitzgerald, Lord Edward". Encyclopædia Britannica. 10 (11th ed.). Cambridge University Press. pp. 443–445. Wikisource has the text of the 1911 Encyclopædia Britannica article Fitzgerald, Lord Edward. Wilson, J. G.; Fiske, J., eds. (1900). "Fitzgerald, Lord Edward, Irish patriot" . Appletons' Cyclopædia of American Biography. New York: D. Appleton. Ida A. Taylor, The Life of Lord Edward Fitzgerald (London, 1903), which gives a prejudiced and distorted picture of Pamela.